NIDA contributed to the development of the FDA-approved nasal spray formulation, but the institute is not associated with commercial distribution of the product. For a copy of the abstract, published in the Journal of Clinical Pharmacology, go to Comparison of the Pharmacokinetic Properties of Naloxone Following the Use of FDA-Approved Intranasal and Intramuscular Devices Versus a Common Improved Nasal Naloxone Device. 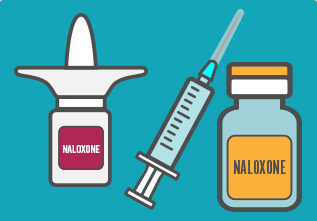 For more information about naloxone and treating opioid overdose, go to: Opioid Overdose Reversal with Naloxone (Narcan, Evzio) and Medications to Treat Opioid Use Disorder. NIDA. "Opioid Overdose Reversal News: FDA-approved naloxone devices produce substantially higher blood levels of naloxone than improvised nasal spray." National Institute on Drug Abuse, 15 Mar. 2019, https://www.drugabuse.gov/news-events/news-releases/2019/03/opioid-overdose-reversal-news-fda-approved-naloxone-devices-produce-substantially-higher-blood. NIDA. Opioid Overdose Reversal News: FDA-approved naloxone devices produce substantially higher blood levels of naloxone than improvised nasal spray. National Institute on Drug Abuse website. https://www.drugabuse.gov/news-events/news-releases/2019/03/opioid-overdose-reversal-news-fda-approved-naloxone-devices-produce-substantially-higher-blood. March 15, 2019.